Fat to fit diaries: Can you run 100km a week without it impacting your work or private life? Can you run 100km a week without it impacting your work or private life? This morning I ran to work. That was 9.29km, including the diversion to drop Negrita off at Central on the way. At lunchtime I ran 5.84km. So that was 15.13km in total (all of it in my Vibram FiveFingers), without affecting my daily schedule at all. The lunchtime run took a shade over 34:59, so by the time I showered and grabbed some food from the kiosk, I was only away from my desk for just over 1 hour (the same amount of time as if I had taken a normal lunch). What today has made me realise is that if I run to and from work, or if I run just one way and do a lunchtime run, I should easily be able to fit in 100km of running per week (including one long run on the weekend). That would be the same amount of running I was doing to prepare for the Marathon des Sables. I don't think I need to do more training for the Ticino trail than I did for the MDS, since the Ticino Trail is only a one and a half day race. However, I will have to find a way to train for the 8,500 vertical metres. 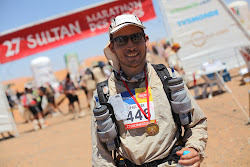 It is also reassuring to know that I should be able to prepare very well for the MDS 2015 without the need to take another sabbatical. Do you find that you are able to fit in large amounts of running without the need to sacrifice anything? Or do you struggle to get in the mileage that you want each week? Well now the nice weather has finally arrived in the UK I am walking to and from walk each day! So hopefully a few of my excess pounds will melt away. I meant to type walking to and from work!! !